Dietary interventions have been shown to attenuate some of the myocardial pathological alterations associated with obesity. This study evaluated the effect of dietary normalization from a fat/fructose/cholesterol-rich diet to chow on left ventricular (LV) myocardial fibrosis, fat infiltration and hypertrophy but also the specific influence of obesity, plasma lipids and glucose metabolism markers on heart morphology in a Göttingen Minipig model of obesity. Forty castrated male Göttingen Minipigs were assigned to three groups fed either standard minipig chow (SD, n = 8) for 13 months, fat/fructose/cholesterol-rich diet (FFC, n = 16) for 13 months or fat/fructose/cholesterol-rich diet for 7 months and then changed to standard minipig chow for the remaining 6 months (FFC/SD, n = 16). Body weight, body fat percentage, plasma lipids and glucose metabolism markers were evaluated in all three groups after 6–7 months (prior to diet adjustment for FFC/SD) and again before termination. Further, biochemical quantification of myocardial collagen and triglyceride content, semi-quantitative histological evaluation of fibrosis and fat infiltration and quantitative histological analysis of collagen and cardiomyocyte diameter were performed and heart weight was obtained after termination. Group differences were evaluated using Kruskal-Wallis test and Fisher’s exact test for categorical variables. Pearson correlation analysis was performed to test for correlations between myocardial changes and selected explanatory variables. For non-parametric response variables, a Spearman correlation analysis was applied. Myocardial collagen content quantified biochemically was significantly lower in FFC/SD compared to FFC (P = 0.02). Furthermore, dietary normalization from a fat/fructose/cholesterol-rich diet to chow caused stagnation of body weight and body fat percentage, normalized intravenous glucose tolerance index (KG) and plasma lipid levels. 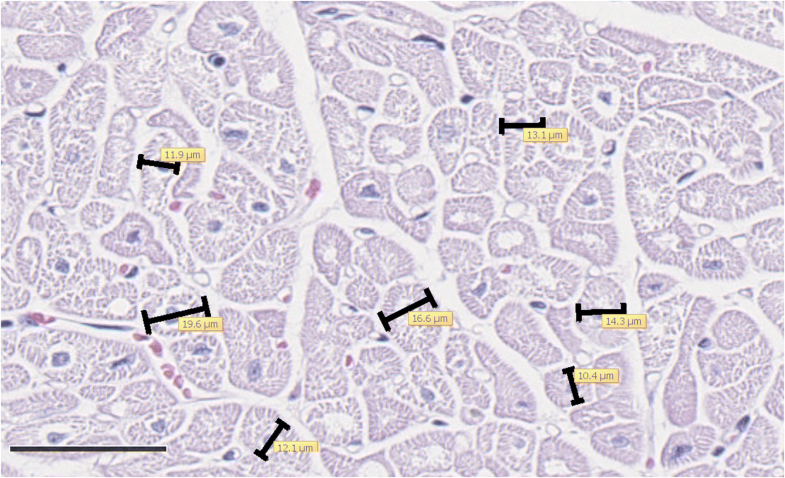 Dietary normalization led to lower LV collagen content in obese Göttingen Minipigs. Despite gross obesity and significant deteriorations in glucose and lipid metabolism, only mild myocardial changes were found in this model of obesity and therefore further model optimization is warranted in order to induce more severe myocardial changes before dietary or pharmacological interventions. Obesity is a steadily increasing health issue, and the worldwide prevalence of obesity has nearly tripled between 1975 and 2016 . This is a major concern because obesity is associated with an increased risk of cardiovascular disease [2, 3], including heart failure (HF) [2, 4]. Specifically, obesity is associated with myocardial accumulation of intra-myocellular lipids causing lipoapoptosis [5–7], left ventricular (LV) hypertrophy [8, 9], and to some degree increased myocardial fibrosis [10, 11]. These obesity-induced myocardial alterations may contribute to impairment of LV function [7, 12–15] and ultimately HF. Dietary interventions accompanied by weight loss have been shown to reduce both LV hypertrophy and myocardial triglyceride content in obese humans [16–19]. Not much is known about the impact of dietary change on myocardial fibrosis in humans, but studies in obese rodents have shown that weight loss obtained by calorie restriction can attenuate myocardial fibrosis [20, 21]. Besides weight loss and reversal of myocardial remodeling, dietary interventions often reduce dyslipidemia and systemic insulin resistance [16, 17, 19, 22]. Improvements in insulin resistance without weight loss have been associated with reversal of LV function abnormalities , stating a possible primary effect of insulin resistance. However, the underlying mechanisms of the attenuation of myocardial remodeling are not yet fully understood. Translational animal models mimicking human obesity could facilitate more effective research in this field, enabling investigations of the underlying mechanisms and providing a better understanding of the related co-morbidities. Over the past 30 years the use of porcine models in cardiovascular research has grown . Compared to rodents, the pig is more similar to humans in terms of lifespan, anatomy, physiology, and metabolism . More importantly, when investigating obesity, the pig displays many of the same metabolic abnormalities as humans when fed excess calories [25–27]. Additionally, myocardial fibrosis, fat infiltration and cardiac hypertrophy have been described in different breeds of obese pigs [27–30]. Using a fat/fructose/cholesterol-rich diet-induced minipig model of obesity, the aim of this study was to test the hypotheses that dietary normalization from a fat/fructose/cholesterol-rich diet to chow would 1) limit the development of LV myocardial fibrosis, fat infiltration, and hypertrophy and 2) improve plasma lipids and glucose metabolism markers. Furthermore, we hypothesized that 3) overall, the degree of obesity and level of plasma lipids and glucose metabolism markers would be associated with heart morphology. This study is part of a large prospective intervention study in Göttingen Minipigs investigating diet-induced atherosclerosis and diabetes- and obesity-related abnormalities in the heart, liver and kidneys. Therefore some of the presented groups and background characteristics will also be published elsewhere in other contexts. The study was approved by the Animal Experimental Inspectorate, Ministry of Justice, Denmark. Castrated male Göttingen Minipigs aged 6-7 months (Ellegaard Göttingen Minipigs A/S, Dalmose, Denmark) were housed at the Experimental Animal Unit at University of Copenhagen for the 13 months duration of study. Animals were single-housed during periods with central venous access (intravenous (IV) catheters) and otherwise group-housed. Animals had free access to bedding material and water, and were kept at a natural day/night cycle. Overview of the study design and feeding paradigm can be seen on Fig. 1. Study design was staggered with a 5-week interval between three cohorts of animals, and all three study groups were represented in each cohort. Animals were assigned to three different study groups; a lean control group (SD, n = 8) fed standard minipig chow that contained 2.8 kcal/g with (percentage by weight) 13.0% protein, 2.1% fats and 52.4% carbohydrate (Mini pig, Special Diet Services, Essex, United Kingdom); an obese group (FFC, n = 16) fed fat/fructose/cholesterol-rich diet (9G4U and 5B4L, TestDiets®, Missouri, USA) and a diet normalization group (FFC/SD, n = 16) fed fat/fructose/cholesterol-rich diet for 7 months and then changed to standard minipig chow for the remainder of the 13 months study period. Two different diets with high fat, fructose and cholesterol content were used in the study. 5B4L was used for the first 5 months of the study period , whereas, 9G4U was used for the remainder of the study in order to avoid extremely high plasma cholesterol. Both diets contained 4.1 kcal/g with (percentage by weight) 16.7% protein, 19.8% fats and 42.3% carbohydrate. The two fat/fructose/cholesterol-rich diets differed in fructose and cholesterol content, where 5B4L contained (percentage by weight) 2% cholesterol and 17.8% fructose and 9G4U 1% cholesterol and 18.8% fructose. All animals were fed individually once daily. Animals receiving the fat/fructose/cholesterol-rich diet were fed 2% of body weight (BW) with maximum 1000 g/day. However, 11 months after study initiation animals in FFC were fed more restrictedly with a maximum of 500 g/day due to severe obesity and lameness. Lean control animals were fed according to the breeder’s recommendations (Fig. 1). When animals in FFC/SD were changed to standard minipig chow they were fed 500 g/day. In vivo evaluations included intravenous glucose tolerance test (IVGTT), blood sampling and a dual-energy x-ray absorptiometry (DEXA) scan and were all done in overnight fasted animals (approx. 18 h). The evaluations were performed in all three groups of pigs at two time points, 1) mid-study, prior to diet adjustment for FFC/SD and 2) before euthanasia. An IVGTT was performed 3 to 7 weeks prior to diet adjustment and euthanasia. The test was performed in awake and unrestrained animals using pre-implanted IV catheters in the jugular or cranial caval vein. After baseline samples, an IV bolus of 0.3 g/kg glucose (500 g/L glucose, SAD, Denmark) was given and blood was sampled at 2, 5, 10, 15, 20, 30, 40, 50, 60 and 90 min after the bolus. Blood was EDTA-stabilized and kept on wet ice maximum 30 min before centrifugation at 2000×g for 10 min at 4 °C. Plasma was stored at − 80 °C until further analysis, except plasma used for glucose analysis which was performed on the day of IVGTT. Intravenous glucose tolerance index (KG) was calculated as the negative slope of the linear regression of the natural logarithm to glucose vs. time from 5 to 30 min of IVGTT and area under the curve for insulin response was calculated at sampling time 0–60 min (AUCInsulin), both as previously described [26, 31]. Blood samples for evaluation of plasma triglyceride and total cholesterol levels were obtained 2-3 days prior to IVGTT, and handled as described above. Body weight was assessed on a weekly basis. One to 2 weeks prior to diet adjustment and euthanasia a full-body scan using DEXA (GE Lunar Prodigy, GE Healthcare, Brøndby, Denmark) was performed in anaesthetized animals to assess body fat percentage and lean body mass (LBM). Relative heart weight was calculated as the ratio of heart weight to LBM, and as the ratio of heart weight to BW. Plasma glucose was analyzed using Biosen auto analyzer (BIOSEN, S_Line, EKF Diagnostics, Cardiff, United Kingdom) according to the manufacturer’s instructions. Plasma samples were also analyzed for porcine insulin content using Luminescent Oxygen Channeling Immunoassay as described elsewhere  with few modifications regarding antibodies (biotinylated mAb OXI005 was used instead of bioinylated X14-6F34). Both triglyceride and total cholesterol concentrations were analyzed using Cobas® 6000 auto analyzer (Roche, Diagnostics Limited, Rotkreuz, Switzerland) according to the manufacturer’s instruction. High-performance liquid chromatography using Superose 6 columns (10/300, GE Healthcare, Brøndby, DK) in an automatized system (Agilent 1100 HPLC system, Agilent Technologies, Waldbronn, GE) was used to estimate group cholesterol fractions; high-density lipoprotein cholesterol (HDL-C), low-density lipoprotein cholesterol (LDL-C), very-low-density lipoprotein cholesterol (VLDL-C). Pooled plasma samples from termination were used and handled as previously described . 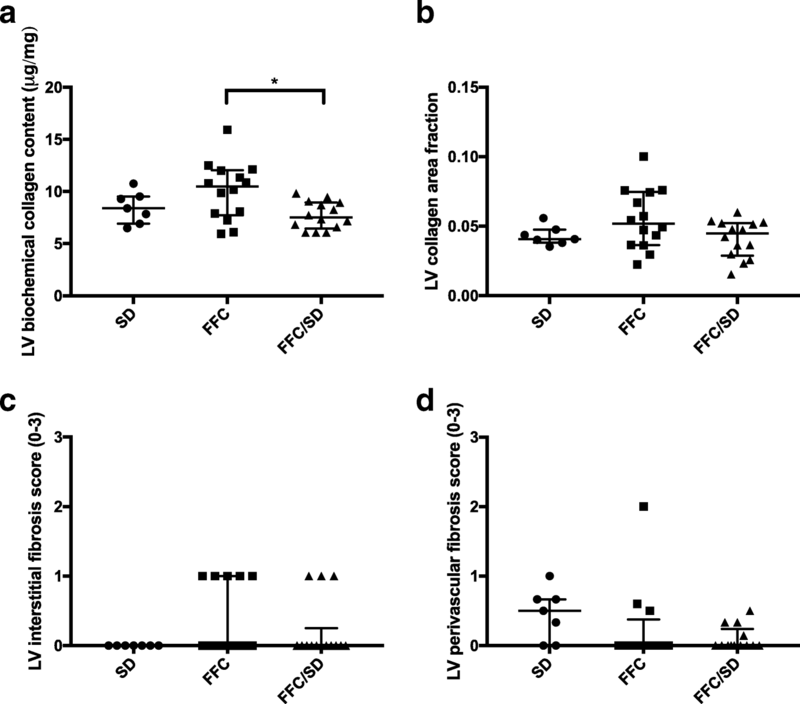 In short, two to three animals with total plasma cholesterol concentrations close to the group mean were selected (SD n = 2, FFC n = 3 and FFC/SD n = 3). Effort was made to select animals so that each cohort was represented. Animals were euthanized in surgical anesthesia by bleeding from the axillae. Hereafter the heart was removed from the animals and weighed. For biochemical analyses 2x2x11mm transmyocardial samples from LV free midwall were snap-frozen in liquid nitrogen and stored at − 80 °C until use. Transmyocardial samples from LV free midwall were also collected for histological analyses. Samples were fixated in 4% neutral buffered formaldehyde for 28 h ± 5 h, dehydrated, and then embedded in paraffin wax. Two tissue sections of 4 μm were either stained with hematoxylin and eosin (H&E) or picro sirius red (PSR) with Weigert’s iron hematoxylin nuclear staining. All sections were digitalized using a NanoZoomer XR (Hamamatsu Photonics, Japan) scanner. Sections with PSR staining were scanned at 20X and H&E sections at 40X magnification. Degree of LV myocardial interstitial, epicardial and perivascular fat infiltration was scored manually on digitalized H&E stained sections using a scale 0/1+/2++/3+++, modified from van Hoeven & Factor . In addition, the degree of interstitial, replacement and perivascular fibrosis was scored on PSR stained sections. Vessel average scores of perivascular fat infiltration and perivascular fibrosis were calculated for each animal. The observer was blinded for group allocation in all histological analyses. Digital image analysis software Biotopix™ for Windows 7, version 7.0.0.2899 (Visiopharm®, Hørsholm, Denmark) was used to quantify LV myocardial collagen fractions on PSR stained sections. Algorithms were designed to detect collagen and remaining myocardial tissue and create regions of interest excluding epi- and endocardium. Manual corrections were performed if needed. A collagen fraction area was calculated. Cardiomyocytes with a central nucleus and cross-sectioned profile were selected, and the shortest diameter through the nucleus was measured on H&E stained sections using a software program (NDP.view2, Japan) (Fig. 2). An average diameter was calculated from 100 cardiomyocytes per section. Using a commercially available hydroxyproline assay kit, (Chondrex Inc., Redmond, WA, USA, CAT no. : 6017) LV collagen content was quantified on transmural LV snap-frozen samples. Before the assay, the LV samples were freeze-dried at − 55 °C (Heto FD3, Heto-Holten A/S, Allerød, Denmark) for 24 h, dry weight was determined and the freeze-dried samples were crushed using mortar and pestle. An acid hydrolysis was then performed using 200 μl 5 N hydrochloric acid per 10 mg wet weight cardiac tissue, and samples were incubated at 99 °C for 36 h according to Hanes and coworkers . After incubation, samples were cooled to room temperature and centrifuged for 3 min at 9000×g. Supernatant was collected and the hydroxyproline assay was performed according to manufacturer’s instructions. All standards, samples and sample blanks were run in duplicate and rerun if coefficient of variance (CV) was more than 15%. LV transmural snap-frozen samples were kept cold on dry ice and crushed using mortar and pestle. Around 100 mg crushed LV tissue was mixed with 2 mL 0.15 M sodium acetate with triton-X100 (0.75%) to solubilize tissue lipids. Samples were then homogenized for 30 s with T25 digital Ultra Turrax® (IKA, Staufen, Germany) at 20000 repetitions per minute and immediately placed in a 90–100 °C water bath for 2 min and 15 s. After cooling down on wet ice, the samples were centrifuged at 3400×g for 10 min and supernatant was collected. Triglyceride analysis was performed using Cobas® 6000 auto analyzer according to manufacturer’s instructions and adjusted to tissue weight. All samples were run in duplicate and rerun if CV was more than 15%. Group differences between continuous variables were evaluated using a Kruskal-Wallis test with Wilcoxon Rank-sum post hoc test. ANOVA was not used due to lack of homogeneity of the residuals even after transformation. Fisher’s exact test was performed on categorical variables (epicardial fat, interstitial fat and interstitial fibrosis) to determine group differences. To test for correlations between myocardial changes and body composition measurements (BW, body fat percentage, LBM), heart weight, circulating lipids (triglyceride, total cholesterol) and glucose metabolism markers (KG and AUCInsulin) a Pearson correlation analysis was performed. A Shapiro-Wilk test was used to test for normality of response variable and if normality was not obtained, a non-parametrical Spearman correlation analysis was performed. Data and results are presented as median and interquartile range (25th–75th). Statistical analyses were made using statistical software (SAS® 9.4, SAS Institute Inc., Cary, NC, USA). Graphical illustrations and calculation of KG and AUCInsulin were made using GraphPad Prism® (7.0c for Macintosh, GraphPad Software Inc., San Diego, CA, USA). A value of P < 0.05 was considered significant for the analyses. Five out of forty animals did not complete the study. Four of these animals were euthanized before time; one due to lameness (FFC/SD n = 1); another due to spontaneous acute bleeding (FFC/SD n = 1) (diagnosed trombocytopenia purpura, a known background finding in Göttingen Minipigs ); and two (SD n = 1, FFC n = 1) as a result of procedure related complications. The last animal (FFC n = 1) died suddenly after a short period with acute respiratory distress, probably caused by circulatory failure. As depicted in Fig. 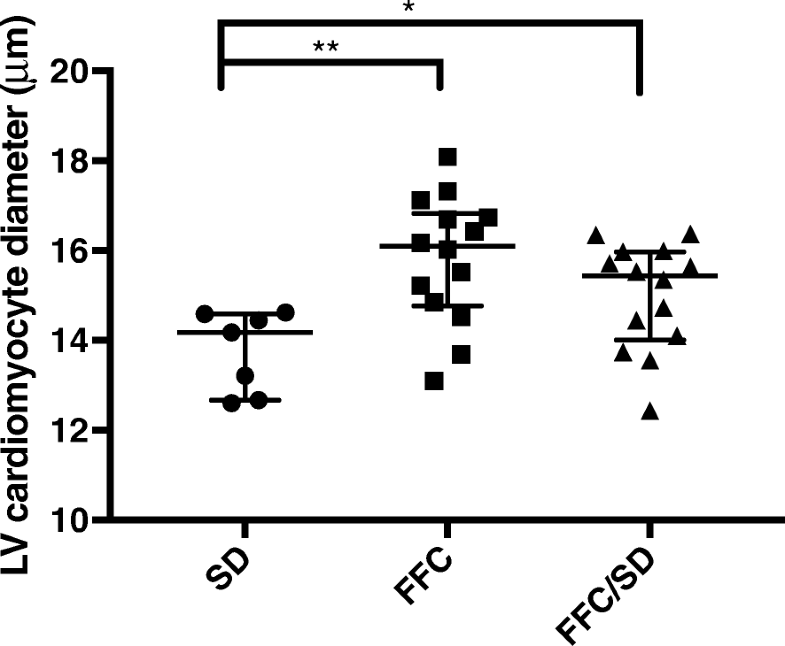 3, BW of FFC/SD stagnated compared to the remaining groups after dietary normalization. Body composition, absolute and relative heart weight data are presented in Table 1. Body weight, body fat percentage and LBM were significantly higher in FFC and FFC/SD compared to SD animals mid-study. No differences were observed between FFC and FFC/SD at this time point. At study termination BW and body fat percentage were significantly higher in FFC and FFC/SD compared to SD animals, and these body composition measurements were significantly lower in FFC/SD compared to FFC. No difference in LBM was observed between groups at the end of study. Heart weight was significantly higher in both FFC and FFC/SD compared to SD animals. Despite no statistical significant difference in heart weight between FFC and FFC/SD, a tendency towards a lower heart weight was noticed in FFC/SD (P = 0.06). Heart weight normalized for BW was significantly lower in FFC compared to both SD and FFC/SD. Furthermore, heart weight normalized for LBM was significantly higher in FFC and FFC/SD compared to SD animals and animals in FFC/SD had a significantly lower normalized heart weight compared to FFC. Circulating lipids and glucose metabolism markers are presented in Table 2. Mid-study, plasma triglyceride levels were significantly increased in FFC compared to SD animals, but no difference was observed between animals in FFC/SD and the two other groups. Animals in both FFC/SD and FFC had significantly increased total cholesterol levels compared to SD animals mid-study. At termination, plasma triglyceride and total cholesterol levels in FFC were significantly increased compared to animals in the two other groups. Furthermore, no differences in triglyceride or total cholesterol levels were observed between FFC/SD and SD animals at termination. Mid-study, KG was significantly decreased in FFC and FFC/SD compared to SD animals suggesting altered glucose metabolism in the two groups. At termination, KG in FFC was significantly decreased compared to the two other groups, whereas no difference between FFC/SD and SD was observed. No differences in fasting glucose levels or AUCInsulin were observed between any of the groups at the two time points. The HPLC results of the pooled samples showed that the SD (HDL-C / LDL-C / VLDL-C: 48.06% / 50.70% / 1.24%) and FFC/SD (HDL-C / LDL-C / VLDL-C: 41.50% / 56.79% / 1.71%) groups had cholesterol fractions distributed predominantly in HDL and LDL, whereas the FFC group (HDL-C / LDL-C / VLDL-C: 13.12% / 47.74% / 39.14%) predominantly had cholesterol fractions distributed into LDL and VLDL. Though, data is not conclusive, a fat/fructose/cholesterol-rich diet feeding appeared to increase amount of LDL-C and VLDL-C, while diet normalization returned the cholesterol fractions to an almost normal distribution. Animals in FFC/SD had significantly lower LV myocardial collagen content compared to FFC when collagen content was assessed biochemically (P = 0.02). However, no difference between SD and FFC or FFC/SD was observed using this method (Fig. 4a). Quantification of collagen by image-analysis revealed no difference between groups (Fig. 4b), and further no significant difference in interstitial or perivascular fibrosis score was found between groups when evaluated semi-quantitative (Fig. 4c, d). However, a trend towards a difference in perivascular fibrosis between groups was noticed (P = 0.06, Fig. 4d). No signs of replacement fibrosis were found in any of the groups. Epicardial fat score differed between groups (P = 0.02). Higher scores were given to FFC animals compared to SD (P = 0.01), but no difference was found between FFC and FFC/SD, or FFC/SD and SD (Fig. 5a). However, no significant difference in interstitial or perivascular fat infiltration score was observed between groups (Fig. 5b, c). 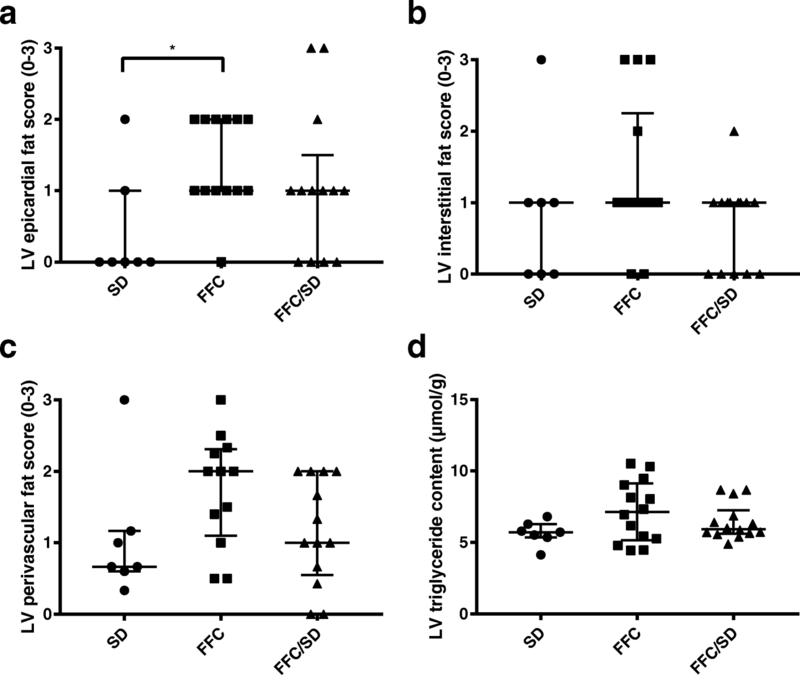 There was no difference in LV triglyceride content between groups when assessed biochemically (Fig. 5d). Cardiomyocyte diameter was significantly increased in FFC (P = 0.005) and FFC/SD (P = 0.04) compared to SD animals. Although not reaching statistical significance (P = 0.09), a trend towards lower cardiomyocyte diameter was observed in FFC/SD compared to FFC (Fig. 6). All correlation analyses can be seen in Table 3. Cardiomyocyte diameter was positively correlated with BW (r = 0.54, P = 0.0008), body fat percentage (r = 0.53, P = 0.001), and heart weight (r = 0.51, P = 0.002). LV triglyceride content assessed biochemically was also positively correlated with BW (rs = 0.45, P = 0.007), body fat percentage (rs = 0.35, P = 0.04), heart weight (rs = 0.35, P = 0.04), and plasma triglyceride level (rs = 0.37, P = 0.03). LV myocardial collagen content assessed biochemically tended to be positively correlated with body fat percentage (rs = 0.32, P = 0.06), plasma total cholesterol level (rs = 0.31, P = 0.08), plasma triglyceride level (rs = 0.30, P = 0.08) and further LV myocardial collagen content tended to be inversely correlated with KG (rs = − 0.35, P = 0.06) and LBM (rs = − 0.29, P = 0.09). Collagen level quantified by image-analysis tended to be positively correlated with BW (r = 0.29, P = 0.09), body fat percentage (r = 0.29, P = 0.09) and plasma total cholesterol level (r = 0.32, P = 0.07). Remaining correlations were not significant. BW body weight, LBM lean body mass, HW heart weight, TC total cholesterol, TG triglyceride, AUCInsulin area under the curve of insulin, KG intravenous glucose tolerance index; *P < 0.05; **P < 0.01; ***P < 0.001. The main finding of the present study is that a dietary change from a fat/fructose/cholesterol-rich diet to standard minipig chow limited the amount of collagen in the myocardium of obese Göttingen Minipigs. However, dietary normalization did not have a significant beneficial effect on any of the other LV myocardial parameters investigated. In terms of other general health benefits of dietary normalization, BW gain was reduced, dyslipidemia was reversed and intravenous glucose tolerance index was improved. Using a biochemical assessment of collagen, animals in FC/SD had significantly lower myocardial collagen content compared to FFC at termination. To date, no previous porcine studies investigating the effect of dietary normalization on reversal of myocardial pathological alteration have been reported. However, previous studies in obese rodents have explained the attenuation of myocardial fibrosis after a dietary intervention by a reduction in myocardial oxidative stress and inflammation [20, 21]. This is in line with porcine studies linking increased myocardial oxidative stress, inflammation and development of myocardial fibrosis [27, 30]. In a previous study of obese Göttingen Minipigs levels of oxidized low-density lipoprotein (oxLDL) and C-reactive protein, markers of systemic inflammation, were found to be increased after 22 weeks of a fat, fructose and cholesterol-rich diet . Dietary fructose has been shown to contribute to inflammation in different tissues  and the dietary content of fructose in the present study may therefore have caused inflammation similar to the study by Ludvigsen and coworkers . Furthermore, increased levels of oxLDL have been directly associated with stimulation of cardiac fibroblast signaling and collagen formation . Regarding oxidative stress in the state of obesity, it has been proposed that hyperglycemia and insulin resistance may increase myocardial oxidative stress as a result of increased lipid metabolism . In agreement with this, we found a tendency to an inverse correlation between LV myocardial collagen content and KG in the present study. Moreover, a study by Kosmala and coworkers  showed that normal body mass index but increased body fat content was associated with a profibrotic state, indicating that adiposity may stimulate fibrosis formation. This is supported by the trend towards a positive correlation between LV collagen content and body fat percentage observed in the present study. 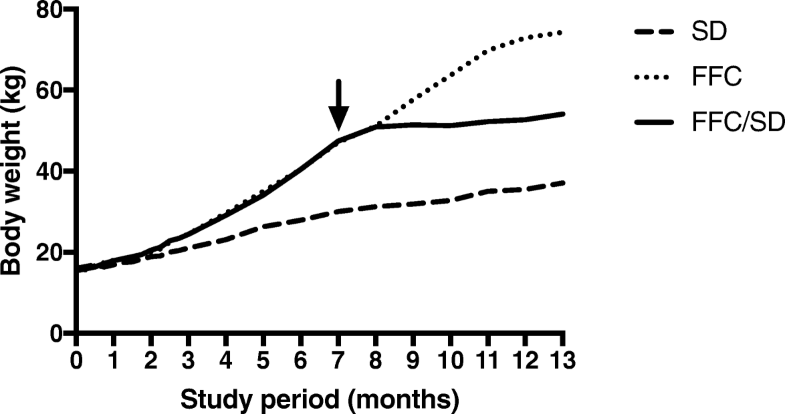 A reduction in systemic oxidative stress and inflammatory markers was induced by 28-days of calorie restriction in overweight and obese women , suggesting that the timeframe of the present study might be sufficient to lower these parameters. Studies of obese humans have shown that weight loss and maintenance of weight loss is important for improvements in LV geometry [16, 22], probably because the increase in body size is a driving factor for the hypertrophic pattern observed in obese subjects , due to pressure and volume overload associated with increasing body size . In the present study, no significant difference in cardiomyocyte diameter or heart weight was observed between FFC and FFC/SD, even though BW was markedly lower in animals in FFC/SD. Autopsy studies of obese humans suggest increase of heart weight until a certain BW threshold, after which only modest heart weight changes are observed [9, 41, 43]. The lower heart weight/BW ratio observed in FFC compared to both SD and FFC/SD may suggest that such a threshold also exist in pigs where animals in FFC may have reached the BW threshold. This relation could also explain why the differences in heart weight and cardiomyocyte diameter between FFC and FC/SD were less pronounced and did not reach statistical significance in contrast body composition measurements. Heart weight was further normalized for LBM to quantify the degree of cardiac hypertrophy  and this revealed a significant difference between FFC and FFC/SD with animals in FFC having the largest ratio. Together with the heart weight/BW ratio, this may suggest that dietary normalization stopped the progression of cardiac hypertrophy. Correlation analyses also revealed positive correlations between obesity (BW and body fat percentage) and cardiomyocyte diameter, stating the importance of body size as a mediator of LV hypertrophy, also in the present study. A positive correlation between cardiomyocyte diameter and heart weight was found in the current study, showing that cardiomyocyte hypertrophy is an important component of increase in cardiac weight. However, it is worth noticing that increased heart weight also can be caused by increased epicardial fat mass or myocardial fat infiltration [44, 45], which is supported by the positive correlation found between heart weight and LV triglyceride content. Furthermore, epicardial fat score assessed histologically was significantly higher in both FFC and FFC/SD compared to SD and this may also have contributed to the larger heart weight observed in these two groups. A limitation of the present study was that no myocardial tissue was collected mid-study, prior to diet adjustment for FFC/SD and therefore it is difficult to determine if the dietary normalization reversed or just stopped the progression of the myocardial alterations. Tissue collection at this time and/or relevant in vivo assessments would therefore have been preferred. A transmural sample of LV was used for the biochemical assessment of collagen whereas the epi- and endocardium were not a part of the histological fibrosis analyses. An increase in epi- and/or endocardial collagen in FFC may therefore have influenced that a significant difference in collagen content only was observed when collagen was assessed biochemically. Compared to previous porcine studies [27, 30] only minor myocardial pathological alterations were induced in FFC despite 13 months of fat/fructose/cholesterol-rich diet. The reason might be difference between porcine breeds or differences in study setup e.g. castration. All animals were castrated before study initiation because castrated male Göttingen Minipigs become more prone to obesity and metabolic changes after castration . Literature state that castration may protect against age-related myocardial fibrosis in mice , but also that castration promotes myocardial fibrosis formation in rodent heart failure models [47, 48]. However, to the authors’ knowledge, no studies have investigated this relationship in pigs. The lack of myocardial changes in the present study poses a limitation to the study and it could be speculated that more pronounced effects of dietary normalization would have been observed if more severe myocardial alterations had been induced. 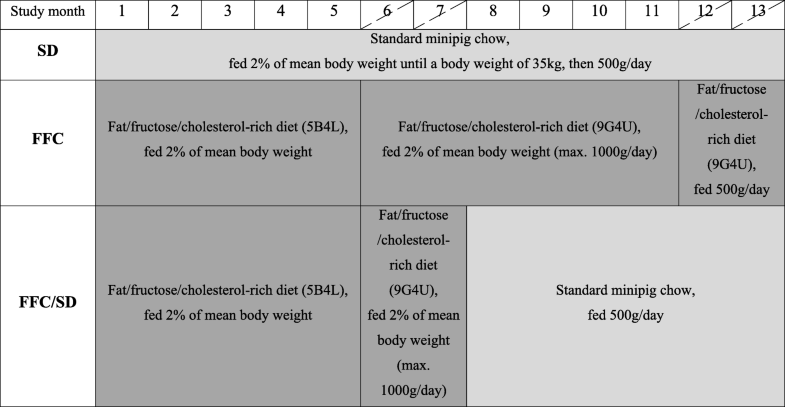 Dietary change from a fat/fructose/cholesterol-rich diet to standard minipig chow limited the development of myocardial collagen content in obese Göttingen Minipigs compared to animals staying on the fat/fructose/cholesterol-rich diet for further 6 months. In addition, the degree of adiposity and glucose tolerance might have influenced myocardial collagen level. Plasma triglyceride and total cholesterol levels also improved after dietary normalization, however, plasma lipid levels did not correlate with myocardial collagen content. Only mild myocardial changes were found in this model of obesity and it is therefore important that future studies focus on inducing more severe myocardial changes before dietary or pharmacological interventions. Laura Jul Andreasen and Simone Krog contributed equally to this work. Belinda Bringtoft, Betina G. Andersen, Christina T. Kjempff, Elisabeth W. Petersen, Jeanette Jensen, Joan E. Frandsen and Marianne K. Petersen, University of Copenhagen and Anders H. Uhrenfeldt, Anita Svendsen, Ann-Charlott Kemp, Ann-Christin Løff, Bettina Brandrup, Birgitte Roed, Camilla Ingvorsen, Chalotte L. K. Pedersen, Charlotte Jensen, Hanne Toftelund, Helle Nygaard, Helle Wagner, Inge Rubach, Johannes J. Fels, Johnny K. Nisted, Jonas Kildegaard, Kamilla Larsen, Kirsten L. Henriksen, Lotte S. Marcher, Pernille K. Pedersen, Sonia R. de Araujo, Susanne J. Rasmussen and student helpers, Novo Nordisk A/S are acknowledge for skilled technical assistance. Professor Torben Martinussen, University of Copenhagen, is acknowledged for helpful guidance on statistical analyses. Professor emeritus Knud Poulsen and veterinarian Torkel Falk from University of Copenhagen, and Professor Ulrik Baandrup from Aalborg University are acknowledged for scientific support and assistance in histological and biochemical analyses. PhD fellows Rikke L. Thomsen and Camilla Schumacher-Petersen are acknowledged for valuable assistance performing the experiment and support during data analyses. The animal experiments were funded by Novo Nordisk A/S and the PhD Grant for SK was financed by the LifePharm Centre (University of Copenhagen). LJA: Data acquisition, interpretation, writing manuscript. SK: Data acquisition, interpretation, writing manuscript. TPL: Study design, planning of experiments, interpretation, writing manuscript. OLN: Data acquisition histology, interpretation, writing manuscript. JEM: Study design, interpretation, writing manuscript. BØC: Study design, planning of experiments, interpretation, writing manuscript. HDP: Study design, planning of experiments, interpretation, writing manuscript. LHO: Study design, planning of experiments, interpretation, writing manuscript. All authors read and approved the final manuscript. The study was approved by the Animal Experimental Inspectorate, Ministry of Justice, Denmark. World Health Organization. Obesity and overweight. http://www.who.int/mediacentre/factsheets/fs311/en/. 2018. Accessed 20 Mar 2018.